The following paragraphs will describe the general connective tissue, because the description of the other types of connective tissue is out of the purpose of this text. Connective tissue is formed of cells and extracellular matrix (fig.1). The matrix in turn is composed of fibres and ground substance. The ground substance is a jelly, aqueous environment. This environment contains collagen fibrils and is controlled by specifically attached proteoglycan molecules. Haemal tissue of the bone marrow or lymphoid tissue provides connective tissue with a number of cell types. The cells reach the connective tissues by the circulating blood and migrate into them through their endothelial walls (Williams 1995). 2. The immigrant population. They are wandering cells with various defensive functions (macrophages, lymphocytes, mast cells, neurotrophils and eosinophils). 1. The resident cell population. Fibroblasts are usually the most numerous cells. They synthesize and secrete most of proteins of the extracellular matrix of connective tissue. They transform into fibrocytes when they become old and inactive. Fibroblasts lay down collagen and elastin fibres and adhere to them. During wound repair, they are predominantly active by multiplying and laying down a fibrous matrix. Various factors such as steroid hormone levels, dietary content and mechanical stress affect their activity. Vitamin C deficiency leads to an impairment of collagen formation. Adipocytes (lipocytes, fat cells) exist singly or in groups in the meshes of many but not all connective tissues. They are specially numerous in adipose tissue. Pigment cells occur in the dermis of skin and in the iris and choroid of eye. Their function is generally to prevent light from reaching adjacent cells. Macrophages (histocytes) are also numerous in connective tissues, where they may be either attached to matrix fibres (stationary or fixed macrophages) or they may be motile (nomadic macrophages). These cells are important phagocytes, which are particularly active during inflammation. Lymphocytes. These cells are typically present in small numbers, but are numerous in pathological states, migrating from adjacent lymphoid tissue or from circulation. Mast cells (histaminocytes) are important defensive cells, which occur particularly in loose connective tissues and often in the fibrous capsules of some organs such as liver. They are associated with the inflammation. They migrate to the injured tissue where they may be disrupted to release their contents such as histamin, heparine. The signal for this migration is the direct mechanical or chemical trauma or the contact with specific antigens to which the body has previously been exposed. Neutrophil and Eosinophil leucocytes. They frequently present in small numbers but when the tissues are infected, they migrate to them in increased numbers. 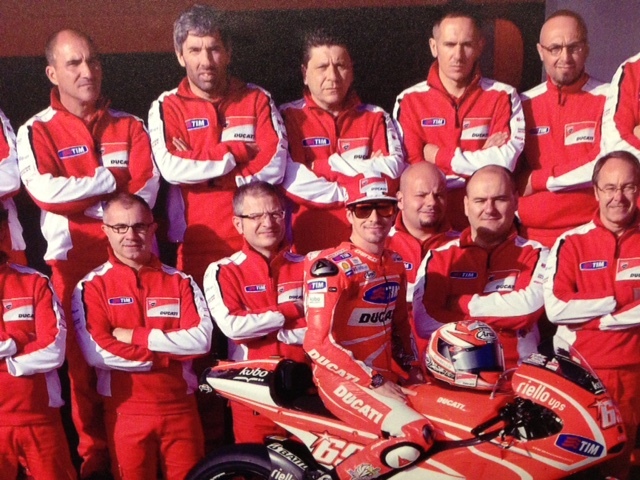 The presentation of the ECM will concentrate on those elements that have prominent mechanical functions. In this sense, the ECM consists of 3 types of macromolecules – fibres (collagen and elastin), proteoglycans (PGs) and glycoproteins. Each of these macromolecules is synthesized and maintained by cells, which are specific to the tissue type (Culav et al 1999). The two most important fibrous components of the ECM are a) collagen and b) elastin, which are insoluble macromolecular proteins. The most prominent feature of collagen is their ability to resist tensile loads. Generally, under tension, they show minimal elongation (less than 10%). This is not the true elongation of the individual fibres. It is the result of the straightening of fibres that are crowded in various 3-dimensional arrangements. Conversely, when a force stretches elastic fibres, they may increase their length by 150%, and after the force has been removed, they return to their previous configuration (Culav et al 1999). 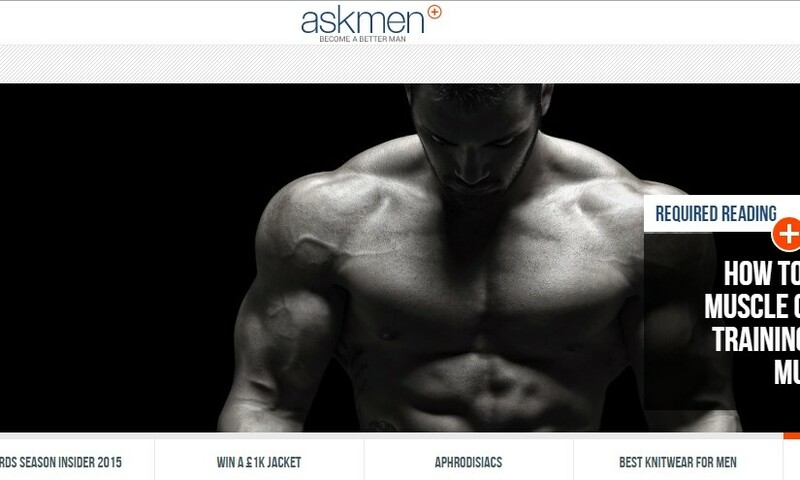 a) Collagen. Collagen is the most abundant protein in the human body, accounting for nearly 30% of all protein (Williams 1995). Nineteen different types of collagen fibres have been found by 1999, all with individual characteristics that serve specific functions in a variety of tissues (Liu et al 1995, Mayne 1997, Culav et al 1999). 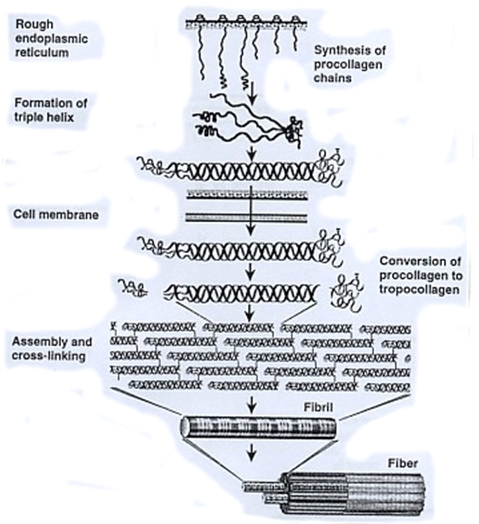 The following paragraphs will describe the fibrillar collagen types I, II and III, which are among the most abundant proteins in the body and are the most relevant to physical therapists. The fibrillar collagens are estimated to constitute over 70% of the total collagen found in the body (Culav et al 1999). Collagen type I has the broadest distribution (Liu et al 1995, Hukins 1990). 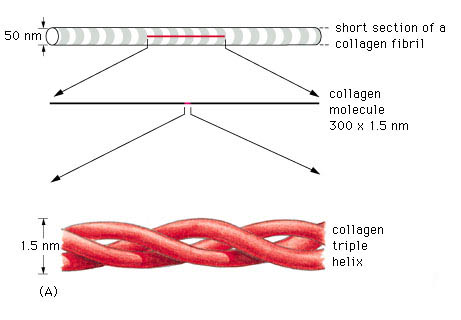 A triple helix is the general structural feature that identifies the fibrillar collagens (fig.2). 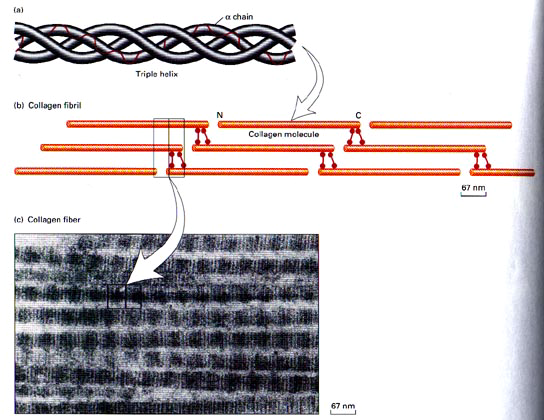 The diameter and length of the fibrillar collagens vary. Their surfaces have characteristic striations formed by gaps between the ends of the molecules (fig.3) (Williams 1995). Type I collagen account for 60% to 90% of the dry weight of skin, ligaments, tendon and bone (demineralised) (Mayne 1997, Williams et al 1997). It is also found in many thin tissues including the lungs and dentin and the sclera of the eyes. In addition, it is the major constituent of mature scars (table 1) (Williams et al 1997). Furthermore, it is found in annulus fibrosus of the intervertebral disc, fibrous cartilage and fascia (Liu et al 1995, Culav et al 1999). Type II collagen accounts for more than half the dry weight of hyaline and elastic cartilage, and it is found in the nucleus polposus and in the vitreous gel of eye (table 1). It is also transiently present in many tissues during embryonic development (Williams et al 1997, Liu et al 1995, Culav et al 1999). Type III collagen is abundant in large blood vessels, skin, liver, spleen, and is found in small amounts in most tissues that contain type I collagen (table 1), but it is not present in bone (Williams et al 1997, Liu et al 1995). For example, the dermal collagen is constituted of 80% – 85% of type I collagen and 15% – 20% of type III collagen (Williams et al 1997). It is the earliest collagen, which is laid down in the healing process, and because its cross-links can be generated rapidly, they provide mechanical strength to the newly synthesized matrix. As the healing tissue gains in strength, the stronger type I fibres replaces type III fibres, if the injured tissue is tendon or ligament (Culav et al 1999). But, if the injured tissue is cartilage, type II fibres replace them. The initial transcript of the major fibrillar collagens (types I, II, and III) is secreted from the nucleus of the cell as interstitial collagen (fig.4). The biosynthesis of individual chains then occurs on the rough endoplasmic reticulum. Subsequently, the chains are folding in the individual triple chains to form the collagen molecule, which is named procollagen. Then, the collagen molecules move to the Golgi apparatus, by which they promoted and extruded from the fibroblast (Mayne 1997, Burgeson et al 1992). Before fibril formation can occur, the procollagen molecules lose their noncollagenus extensions at their terminal regions and become negatively charged molecules named tropocollagen. Many molecules of the tropocollagen are arranged side by side to form the quarter-staggered fibrils. This configuration is visible in the electron microscope and characterized by distinct cross-band. The fibrils are stabilized by the formation of cross-links between individual molecules (Mayne 1997). The fibrils join together to form fibres (fig.4), which in turn combine together to form bundles of collagen fibres The first can be seen only under the light microscope, while the bundles can be seen unaided (Culav et al 1999). This procedure occurs for the morphogenesis and remodelling of tendons. For the other tissue, it is poorly understood how collagen fibrils form and whether fibril formation is closely associated with the cell ( Mayne 1997). Fibrils may also be formed of more than one type of collagen (Culav et al 1999). For example “The banded cartilage collagen fibres are thought to contain types II and XI, and the noncartilage banded fibres contain mixture of types I, III, and V collagens.” (Burgeson et al 1992). The presence of rubber-like elastic fibres determines the elastic properties of tissues such as skin, large blood vessels, lung and large ligaments (fig.5). Elastic fibres are unstructured, in the sense that their molecular components are not assembled in the regular pattern. The major constituent of elastic fibres is elastin (Williams et al 1997). The elastin arrangement varies depending largely on the strength and direction of forces on the tissue. Elastic fibres consist of an elastic core with some microfibrils located mostly around the periphery (fig 6). The exact mechanism of extensibility is not clearly understood. However, the quantity of elastin found within the tissue is usually reflected by the amount of mechanical strain inflicted on it and the requirement for reversible deformation. Some tissue, such as tracheobronhial tree of the lung, walls of arteries, and dermis are rich in elastic fibres, but some others such as ligaments, contain relatively sparse amount of elastic fibres, except the ligamenta nuchae in cervical spine and ligamenta flava of the thoracic and lumbar spine (Culav et al 1999). Elastin is synthesized by smooth muscle cells and to a lesser extent by fibroblasts, but how it is synthesized is unclear. 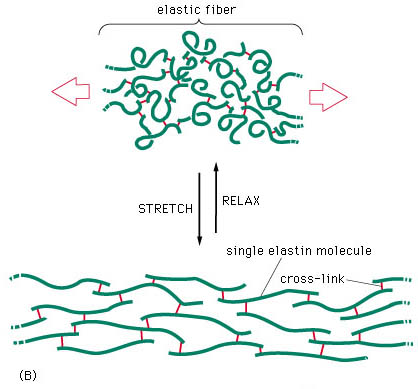 After elastin is secreted, it undergoes extensive cross-linking reactions with other elastin monomers and creates an extended insoluble fabric that provides tissue with elastic properties (Williams et al 1997). A major problem in adults is the lack of regeneration of functional elastic fibres. This results in the inability to restore normal function. Elastin, however, is synthesized by adult tissue in response to cyclic stretching, injury, and ultraviolet radiation. A number of disease states, including emphysema, also lead to synthesis of elastin. Adults, apparently, cannot rebuild the elastic fibre assembly mechanism, and function is not restored. Generally, the mechanisms of control of elastic fibres formation are unknown (Culav et al 1999). According to their composition in type of glycosaminoglycan chain (GAG), all proteoglycans are named: chondroitin sulphates 4 (CS A) and 6 (CS C), keratan sulphate (KS), dermatan sulphate (DS), heparan sulphate (HS), and hyaluronan (HA) (Williams 1995, pages 84-86). They hydrate, stabilize and fill the space of the extracellular matrix (Culav et al 1999). The PGs are consisted of a core protein at which are covalently attached one or more sulphated glycoasaminoglycan (GAG) chain, except hyaluronan, which neither attached to a protein core, nor sulphated (Hukins 1990, Williams 1995). However, it is usually included into the PG group, because it is the most abundant of the GAGs, and it has an important role in connecting to the other PGs to form supramolecular compound structures (Culav et al 1999). There are various GAG chains with generally specific cores to each of the PG types. The GAG chains consist of repeating disaccharide units. The type and the number of units largely define the properties of the PG. Because of their negative polarization, all GAGs have a propensity to attract ions, and create a high osmotic activity that results in the absorption of water from surrounding tissues (Hukins 1990). The amount of hydration depends on the number of GAGs chains (Culav et al 1999). 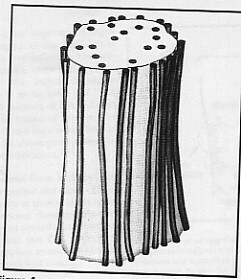 According to Williams et al (1997), the polyanionic character of the proteoglycans and the resulting swelling pressure keep the collagen fibrils apart and award stiffness on the porous gel, which they create. The percentage of GAG with in CT varies directly proportional to the mechanical load. The higher the compressive forces acting on the tissue, the larger content of PG in it (approximately 8%-10% of the dry weight of the tissue). Conversely, in tissues, which are exposed in tension loads such as tendons and ligaments, PGs are concentrated in relatively small proportion (approximately 0,2% of dry weight). (Culav et al 1999). • Small PGs, which consist of the globular protein as the head and one or two glycan chain as the tails. • Very large PGs, which are very complex molecules. They are consisted of 3 globular protein cores, which are bonded to hyaluronan. About 100 glycan chains are attached to each core (fig.7). 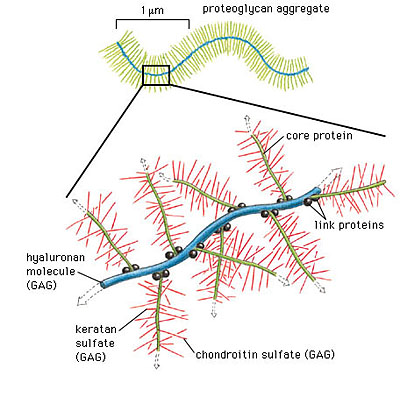 Culav et al (1999) divide the PGs in aggregating (large and very large) and nonaggregating (small) proteoglycans. The small or nonaggregating PGs are attached at specific binding sites on the surface of collagen fibres and interact with them. The role of PGs in withstanding compression is limited, but they contribute to mechanical stability by their interaction with the collagen fibres. They are found in cartilage, disc, tendon, skin sclera, cornea. The aggregating (large and very large) PGs are like the bristles of a bottlebrush, which fill the interfibrillar space. They are found in skin, sclera and tendon, and the very large ones are abundant in cartilage, disc and blood vessels. The large density of the aggregating PGs in cartilage and in the nucleus polposus of the intervertebral disc induces the movement of water into the matrix, resulting in the ability of these tissues to resist compressive forces (Culav et al 1999). All PGs do not permit the neighbouring collagen fibres to been fused. Glycoproteins do not have mechanical functions, but they are important in stabilizing the surrounding matrix and linking the matrix to the cells. They regulate many functions of the cells such as producing changes in their shape, increasing their mobility and stimulating their proliferation. Among the best-known glycoproteins are fibronectin, tenascin, laminin, link protein, thrombospondin, osteropontin and fibromodulin. Generally, the blood supply of the connective tissue is poor, although some of the forms of the dense tissue, such as the dura mater and periosteum, have very rich blood support. Many blood vessels may pass through connective tissue en route for other tissues without supplying it (Williams 1995). The lymphatic vessels are abundant in most types of the connective tissues, particularly beneath the skin. They are numerous in tendons, especially in their sheaths (Williams 1995). Many kinds of nerve endings terminate in connective tissue and supply sensory innervation, which identify mechanical stresses, painful stimuli and thermal changes. Sympathetic innervation of the adipose tissue is important in controlling the metabolism of adipose cells, especially the breakdown of lipid (Williams 1995). Human development begins with fertilization of an ovum. But between this initial contact and birth a series of complicated changes occurs. This involves both differentiation and reorganization of cells to form the different tissues, organs and organ systems to create a viable individual. Immediately after fertilization the zygote undergoes repeated mitotic divisions, resulting in a ball of cells. When the cell has divided into a mass of sixteen cells (Now called the Morula) it enters the uterus wall. Differentiation continues so cells within the Morula are labeled depending on their position and function. Simplification of the cell structure can label these into three zones: The Ectoderm, Endoderm and Mesoderm (Palastanga et al 1994). The Ectoderm gives rise to the skin and its derivatives and the central and peripheral nervous system. The Endoderm forms many epithelial tissues of the body which lines many major bodily systems, e.g. Digestive and respiratory tracts. The Mesoderm forms various structures including the dermis, circulatory system, bone and cartilage. The Mesoderm also gives rise to many specialist cells including Mesenchymal cells. These cells differentiate and specialize again to form the soft tissues, bones, muscles and nerves of the body. Firstly paraxial mesenchymal cells are responsible for the development of the vertebrae, portions of the neurocranium and axial skeleton. All voluntary muscles throughout the head, trunk, limbs, and the dermis of the skin. The neural crest mesenchymal cells are responsible for the development of many soft tissues throughout the head including nerves, viscera, ligaments, tendons, fascia, muscular and dermal connectives tissue and the meninges. The neural crest also patterns the development of the nerves, muscles and blood vessels in this location. Schwann cells too, which are key regulators of peripheral nerve development originate from the neural crest and differentiate into myelin and non-myelin forming cells. Finally the somatopleuric mesenchymal cells give rise to the skeletal elements, ligaments, tendons, fascia, muscular and dermal connective tissue throughout the trunk and limbs. These specific mesenchymal cells also pattern the development of nerves, muscles and blood vessels in these locations. Human cells undergo specific differentiation and specialization immediately after fertilization. Basic cell structure can be split into three zones; ectoderm, endoderm and mesoderm. 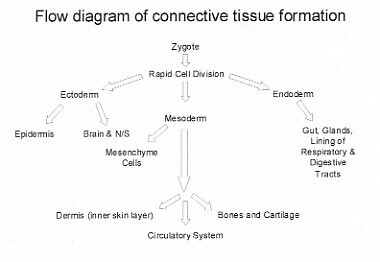 Connective tissues arise from specialist cells within the mesoderm zone. 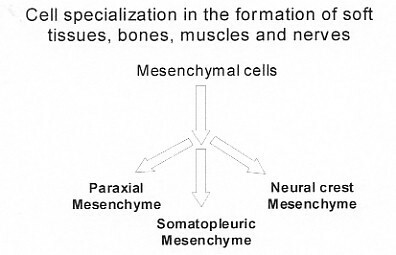 These mesenchymal cells are further divided into three distinct subgroups; paraxial, neural crest and somatopleuric. All connective tissues found within the body arise from neural crest and somatopleuric cells. It is a complicated stage where the induced tissue may change or both tissues involved also may change in various combinations. In Human Function and Structure,(Luciano 1978) cells, in fact, multiply, migrate and specialize, forming layers which can fold, fuse, separate and elongate in order to shape the human body. Other cells, which have not undergone cell differentiation, are known as stem cells. Some other undifferentiated cells can remain and multiply in the various organs where, under an appropriate stimulus, may then go through a delayed differentiation into a specialized cell type. At the stage of fertilization every cell in the growing embryo receives an identical set of genes some of which are either turned off or on (i.e., from messenger RNA and the corresponding protein). Cell differentiation depends on the above mechanism suggesting a quantitative as well as qualitative control of gene expression. Two types of interactions are described (Gray 1995): Permissive and Instructive; in a permissive interaction the signal between the apposing tissue and the responding tissue does not influence the developmental pathway selected. The responding tissue has the intrinsic capacity to develop and to express this capacity it only needs the appropriate environmental conditions. Permissive interactions are often more common in a later stage of the development where the pre-determined fate of some tissue is only maintained and stabilized by another. An instructive interaction changes the cell type of the responding tissue. Condensation, (Hall BK 1992) is described as the first cellular product following tissue interaction and they are attributed a pivotal role in initiation of the vertebrate skeleton in embryonic development and in the modification of skeletal morphology during evolution. Therefore, particularly important are the interactions between Epithelial and Mesenchymal cells during embryonic development, which take place in a reciprocal manner. These spatial, temporal sequential interactions both permissive and instructive leading to the differentiation and morphogenesis of most tissues and organs are termed epigenetic cascades. Ultimately, Connective Tissue (CT) is therefore the result of specific processes that occur during early embryonic development (Watkins 1999). Tendons, ligaments and aponeurosis for example are the result and a combination of few cells and large amount of non -cellular material named matrix, produced by the cells. It is, in fact, the matrix the element that gives the various types of CT a different structure and function also. Mechanical support, concerned with providing strength or elasticity as in binding together the cells of the body, supporting various organs and holding them into place, providing shock absorption and flexible links between bones and transmitting muscle forces. Intercellular exchange, concerned with the circulation of body fluids, hence homeostasis. 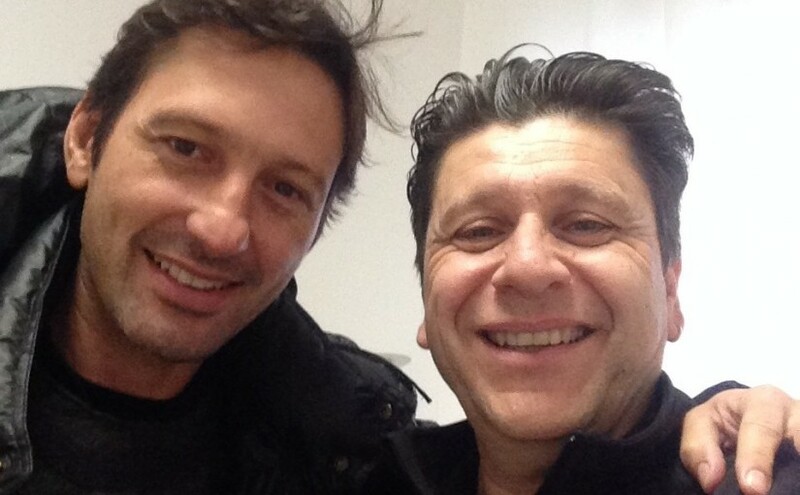 Today on Google News Italy the research fisioterapista (physiotherapist) will reveal in first position a press release about Alfredo Dente and his new physio clinic in Milan. Abstract: Thoracic Outlet Syndrome (TOS), especially “non-specific neurogenic” TOS, is a challenging subject for discussion because of its anatomical and pathological implications. While the vascular type of thoracic outlet compression is recognized and accepted because of the objective findings during physical examination, supported by technologically advanced invasive and non-invasive forms of investigation, some authors, on the other hand, go as far as rejecting the existence of a non-specific neurogenic TOS since objective evidence is just not available. A differential diagnosis can be an ambitious goal, since a whole range of conditions can cause similar symptomatology and lack of reliable clinical and diagnostic tests can compromise the effectiveness of both conservative and surgical treatment protocols. Nevertheless, surgical intervention is well accepted by both the surgeons and patients, though evidence of positive outcome is still disputed by some authors and, furthermore, in presence of an uncertain diagnosis. It is therefore understandable the refusal of some clinicians to classify this clinical presentation as non-specific neurogenic TOS until we are certain of the causes and the mechanisms behind this pathology. This is why assessment skills, recognition and logical interpretation of correlating subjective and objective findings may lead the clinician more effectively towards an appropriate management while more research is carried out. Thoracic Outlet Syndrome is the most commonly used term to describe a combination of signs and symptoms related to compression of neural and vascular structures in the region correctly termed thoracic inlet (Novak CB 1996). Various names have been attributed to the disorder over the years and these include Cervical rib syndrome, Scalenus Anticus Syndrome, Costoclavicular Syndrome, Brachiocephalic Syndrome and many others (Ault J 1998) also related to the anatomical structures which are believed to be involved with the pathological mechanisms likely to occur. Of all cases of TOS only 10% are thought to be of vascular origin (Atasoy E 1996, Ault J 1998) and the remaining 90 % are classified as true neurogenic and non-specific neurogenic type (85%). Historically the syndrome is associated with the presence of anomalous anatomical structures such as a cervical rib, or acquired changes in the surrounding tissues (Atasoy E 1996) a theory, accepted by many but now disputed by some, that explains the development of more or less complicated surgical approaches. It appears, in fact, that surgery is at times proposed as an option on the basis of one diagnostic tests (electrophysiological or nerve conduction velocity test) which reliability is questionable (Ault J 1998, Gillard J 2001, Le Forestiere N 1998) with long term outcomes not very encouraging (Axelrod DA 2001, Franklin GM 2000, Landry GJ 2001). It is evident that lack of a logical and evidence based approach in the treatment and management of this pain syndrome is a reason for concern but the debate is open and the contribution of every party involved is a step forward in the understanding and in a clearer classification. In the US the incidence of TOS is 3-80 cases per 1000 people and it is more common in females than in males. Symptoms appear in patients aged 20-50 years. The mean age of patients who have arterial complications is 10 year older than the mean age of patients who have neurologic or venous symptoms (Kalra 2002). In the soft tissue group congenital bands and ligaments variations, as well as congenital or acquired scalene muscle changes, are included (Atasoy E 1996). It is postulated that congenital anatomical variations do not always cause the symptoms. In fact, congenital bands are present in more than half the population and less than 1% of the population ever develops TOS (Ault J 1998). Also only 4% to 10% of patients operated on with a diagnosis of TOS present with thoracic bony anomalies such as cervical ribs (Oates SD 1996). A recently published paper on surgery as management of patients with neurogenic TOS, concluded that the presence or absence of a cervical or anomalous first rib did not improve the success rate (Sanders RJ 2002) and that neck trauma is the most common cause for the condition in the presence of abnormal ribs. Cervical and anomalous first rib would therefore more likely to be the predisposing factor rather than the cause for TOS (Roos DB 1999, Sanders RJ 2002). Several musculoskeletal structures contribute to form the area anatomically termed the thoracic inlet (fig.1). Many sites of compression have been identified but the most common are believed to involve the interscalene muscles interval, the costoclavicular space and the subcoracoid area. The brachial plexus and both the subclavian artery and vein, supplying the upper limb, are surrounded by both bony and soft tissue structures in a narrow anatomic space. The first rib is broad, flat, wider and shorter than succeeding ribs. It slopes downward and forward from its vertebral to its sternal head. The neurovascular structures pass above its most inferior part. The central portion superiorly presents two grooves, the posterior one for the subclavian artery and the anterior one for the subclavian vein. 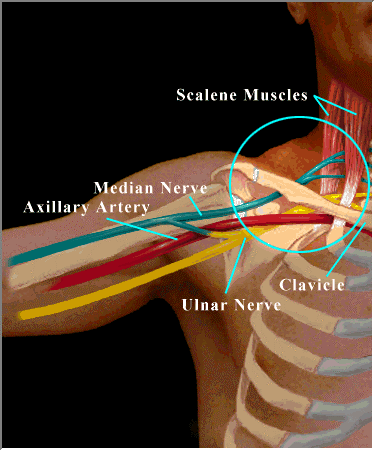 Between the grooves is a tubercle for the attachment of the scalenus anterior muscle. The clavicles has two curves, convex forward medially and convex posteriorly on its lateral aspect. Medially it is in relation inferiorly and posteriorly with the subclavian vessels and with the cords and terminal branches of the brachial plexus, being separated from them by the subclavius muscle (Kreig L 1993). 2) Traction on the ascending neurovascular structures over the first rib. Space occupying lesion of the thyroid gland, pleura or lung could also cause compression against the first rib. A chronically elevated first rib in emphysematous patients, for example, can provoke stretch on the neurovascular elements ascending higher to pass over the rib. Its increased obliquity, by decreasing the costoscalene angle, may also make these structures more vulnerable to compression by scalene anterior muscle. Other causes may be identified in a postfixed brachial plexus arising from C6-T2 having to ascend higher to exit the thorax. Postural changes, affecting mainly women with excessively long necks and low set shoulders (Kreig L 1993) is considered to be one of the causes also. The scalenus medius vertebral insertion is on the posterior tubercle of the transverse process usually from the first cervical certebrae to the seventh and the distal insertion is on the superior aspect of the first rib. These muscles usually lie in contact with each other and the roots of the brachial plexus emerge from the cleft between the two, with the subclavian artery joining the laterally. The subclavian vein generally passes anterior to the scalenus amterior (Nichols HM 86). Pectoralis minor arises from the outer surface of the second to fifth ribs and inserts onto the coracoids process after running upwards and laterally. The cords of the brachial plexus pass inferior to the coracoid and posterior to the muscle before entering the axilla. Variations of the scalenus anterior attachment, like a more posterior insertion, widened or conjoined insertion of scalenus anterior or medius may narrow the costoscalene triangle. A spasm or hypertrophy of these muscles, from trauma (whiplash injury), poor posture or nerve root irritation could potentially cause TOS symptoms. The ventral roots of the primary divisions of the 5th, 6th, 7th, 8th cervical and 1st thoracic spinal nerves make up the brachial plexus, occasionally with twigs from the 4th cervical and 2nd thoracic nerves. (Nichols HM 86). The roots unite to form three trunks after emerging from the slit between the anterior and middle scalene muscles. The 5th and 6th nerves form the upper trunk, the C7 ramus forms the middle trunk and the C8 and the 1st thoracic nerves form the lower trunk. The latter lies in close relation to the first rib. The trunks then rearrange to form three cords behind the clavicle: lateral, posterior, and medial before passing beneath the pectoralis minor together with artery and vein and entering the axilla where the plexus divides into median, ulnar, radial and musculocutaneous nerves. “Sites of potential nerve constriction (e.g. the carpal tunnel syndrome) or transit points of small branches across fascial planes are locations of special risk. Conditions here a ripe both for the production of ectopic neural pacemaker nodules upon local trauma, and also for their mechanical stimulation during body movement.”(Devor M 1991): the quotation refers to a new concept and interpretation of neurogenic pain. An insult in the peripheral nervous system can progress, for some reason, to abnormal discharge and produce a response modulated and modified by the central nervous system. I like to think that there could be a close relation between the concept of ectopic neural pacemaker (Elvey and O’Sullivan 2002) and non-specific TOS clinical presentation. Diagnosing skills have become a priority and a necessity for those involved in treating patients with musculoskeletal disorders, especially when treatment is expected after a physical evaluation which represents the first contact with the clinician. There are numerous conditions that can suggest or even mimic neurogenic TOS and they need to be considered carefully and ruled out during the subjective and objective examination. Some systemic diseases like RA, angina, Pancoast tumor, hypothyroidism, spinal cord lesion for example or glenohumeral instability, impingement syndrome affecting the shouldergirdle, cervical degenerative disc disease, cervical radiculopathy, myofascial system referred pain (scalenes muscles, pectoralis muscles supraspinatus muscles) peripheral nerves entrapment like Carpal tunnel syndrome (CTS) to mention the most common, they potentially can be all misinterpreted as TOS. • The Wright’s test or Hyperabduction Manoeuvre (Magee DJ 1997) used to detect compression in the costoclacvicular space: the patient’s arm is hyperabducted with the hand over the head with the elbow and the arm in the coronal plane both in sitting and supine positions. Taking a breath, rotating or extending the neck might have an additional effect. The pulse is palpated for differences. • The Adson Manouevre used to detect the scalenus anterior entrapment: the examiner locates the radial pulse then the patient’s head is rotated towards the tested shoulder. Neck extension, lateral rotation and extension of the shoulder while the patients is instructed to breath in deeply should provoke radial pulse disappearance. • Roos Test or elevated arm stress test (EAST) applied to detect vascular insufficiency and the Provocative elevation test as a variation: patient standing, abducts the arms to 90 degrees, laterally rotates the shoulders and flexes the elbows to 90 degrees. The patient is then asked to open and close his hands slowly for three minutes. If ischemic pain, heaviness or profound weakness of the arms, tingling in the hand or inability to keep the arm in the starting position are detected then the test is considered positive. • The Allen test, again, looks for variations in the pulse (disappearance) examined while the patient’s elbow is held flexed to 90 degrees, the shoulder is held extended horizontally and laterally rotated and the head is actively rotated away from the test side. Obliteration of pulses in at least 92.6% of asymptomatic adults was described using the Wright’s test or hyperabduction manouever (Oates SD 1996). Positive Roos (EAST) test was found to be positive in 74% of asymptomatic controls and 92% of carpal tunnel syndrome patients (Oates SD 1996) and Wilbourne wonders how the same test can actually be used to diagnose any brachial pathology since he believes that no mechanical stress can be achieved anatomically in the position required by the test (Wilbourn ASA J 1999). On the other hand the Adson test was found to be the most effective when used in combination with another test, especially the Roos (EAST) test (Gillard J 2001). Many are unfortunately disputing the validity and reliability of the above tests, to diagnose TOS. In terms of reliability and accuracy, with reference to neurogenic TOS, subjective diagnostic tests alone also do not represent a safe tool we can solely rely on. X-ray of the cervical and thoracic spine clearly is the first choice to confirm some anatomical abnormalities of the skeletal system and plain chest x-ray can be helpful to either investigate further or rule out the presence of malignant growth. Ault et al. (1998) make clear that nerve conduction velocity (NCV) tests are not reliable when dealing with non-specific TOS because no normal value really exists to be compared with and that range can vary with arm positions as well as right to left. Gillard et al (2001) dispute the use of electrophysiological studies because the access to the thoracic inlet is very difficult and therefore contributing to a high rate of normal readings. This appears to be the reason that has fuelled the controversy about the existence of pure neurological forms of TOS. Moreover, because the nerve entrapment can be intermittent and can involve an extremely short segment of the nerve, therefore readings, again, can be normal. Roos (1999) agrees with the above theory also shared, in his opinion, with many neurologists and furthermore, becasue the “C” fibers, which are thought to be involved possibly from compression ischemia, cannot be studied with current technology then, obviously, the results cannot be considered highly significant. On the other hand, although controversy over the use of NCV test is well acknowledged, Le Forestier et al. (1998) believe that electrophysiological studies are an important aid to localize the site of the lesion in case of true neurogenic TOS and they report a connection between NCV tests and radiological tests showing congenital bilateral cervical rib or an elongated C7 transverse process in 6 cases of female patients. Surgery also confirmed the presence of a fibrous band causing the lower part of the brachial plexus to be over stretched and angulated. Surgery relieved pain after 1-4 weeks but at 1 year follow-up the electrophysiological results were unchanged (Le Forestiere N 1998). Other diagnostic tests include Doppler ultrasonography, which was found useful in providing evidence of vascular compression only in patients with at least two positive provocative tests but not in asymptomatic subjects (Gillard J 2001). In the same study Gillard et al. 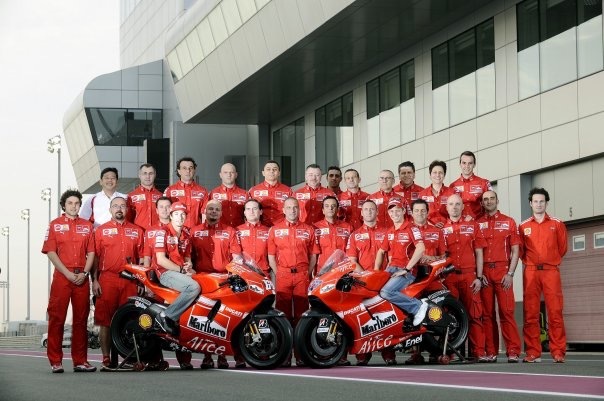 considered the use of Helical 3D CT angiography and they found it helpful to locate the site of vascular compression. It was found, interestingly, that some patients showed evidence of stenosis beneath the pectoralis minor muscle, which might explain why some patients remain symptomatic after surgery limited to the first rib. They concluded that the use of this diagnostic tool may be appropriate to select the best surgical approach but there would still be the need to choose which vascular component to investigate, either arterial or venous, since both are not necessarily affected at the same time. Both the above diagnostic tests would not be useful in the diagnosis of neurogenic TOS as they specifically investigate the vascular system. It is believed that about 10% of all TOS cases are predominantly vascular (venous and arterial) while the remaining cases are neurogenic (true or non-specific or disputed neurogenic) (Atasoy E 1996). Roos (1999) describes the latter presenting with progressing symptoms ranging from light, occasional nocturnal or positional paresthesias in the arm and hand, to incapacitating pain and disuse with weakness and even atrophy of the intrinsic muscle of the hand with diminished sensation in the ulnar nerve distribution. Wilbourn (1999) too believes that a progression of the symptoms characterizes the non-specific or disputed neurogenic TOS although the mechanisms and manifestations of this progression remain unclear. Atasoy (1996) describes a combination of symptoms presentations according to which part of the brachial plexus is believed to be involved in the pathological process. In his opinion the most common of all (90%-95%) involves the C8-T1 nerve roots and their distribution with paraesthesie involving the ulnar nerve, weakness, easily fatigued extremity, coolness, cold intolerance and swelling. The pain is usually dull, aching and at times sharp and throbbing. The involvement of the sympathetic system and the accompanying, sometimes, clinical features (vasomotor changes like coldness and blanching of the hand, shiny skin, thickening and curling of the fingernails) is believed due to the common path shared by the sympathetic fibers with the fibers carrying deep pain sensation passing through sympathetic ganglions and entering the anterior surface of C8-T1. Upper plexus involvement (C5, C6, C7) can cause pain on the side of the neck radiating to the mandible and the face with sometimes earache and occipital headaches, always according to Atasoy (1996). This theory is highly criticized by Wilbourn (1999) who points out that the above anatomical regions are not innervated by the brachial plexus. It’s more likely that the greater occipital nerve, believed to be responsible for the mediation of occipital pain, may be secondarily in spasm as it passes the posterior musculature of the neck. • History of insidious onset with nocturnal symptoms noted at first with negative diagnostic tests and possible trauma in distant past related to first rib or clavicle. We can safely acknowledge that reaching a plausible diagnosis of non-specific or disputed neurogenic TOS is not a simple task especially considering that such a syndrome is not yet fully recognized by many in the medical profession. Treatment, therefore, can vary according to the clinical presentation, to the time in which such presentation occurs and to the severity. A thorough subjective examination can provide a vital and invaluable collection of information, with particular attention to the body chart. Pain behavior and its changes in relation to occupation and other activities involving the use of the upper limbs becomes an essential clue. The objective examination should be carried out with the aim to locate the site of possible pathology and rule out mimicking conditions, especially if malignant causes are suspected. Also Observation for postural disorders, muscle length tests, motion palpation test and neural tissue provocation tests, as well as the clinical provocative tests mentioned earlier, are a combination of valuable tools at the clinician’s disposal which reliability can be justified if they are all applied in combination and systematically according to principles of accepted anatomy and biomechanics. All findings, in fact, are supposed to correlate with each other including any available objective diagnostic investigations in order to implement a plan of treatment (Elvey RL 2002). Great concern, nonetheless, is represented by the use of invasive and costly procedures when evidence of their efficacy appears to be unsupported, with lack of randomized controlled trials. 7) Combinations of the above. The anatomic approaches vary and they include supraclavicular, transclavicular, subclavicular, transaxillary, posterior, and combined. Transaxillary first rib resection and cervical scalenectomy are considered the most popular and standard procedures (Atasoy E 1996). The former is mainly recommended for the lower type of TOS involving C8-T1 roots of the brachial plexus while the latter is preferred for the upper type of TOS with C5-C6-C7 root symptoms. A combination of the two procedures above is also believed to be very effective in physically suitable patients in order to achieve a total decompression of the region and to reduce chance of recurrence with a 75% to 80% of improvement in the extremities. In a recent study Franklin et al. (2000) examined insured workers under a compensation system in the Washington state. Two sample groups were identified, the first one between 1986 and 1991 received surgical treatment, and the second between 1987 and 1989 did not. The patients in the surgical group had 50% higher medical costs and were three to four times more likely to be work disabled. The non-specific Neurogenic TOS diagnosis and the complexity of workers compensation cases were identified as possible causes for worse outcomes and a need for well-designed and randomized trials was emphasized. Axelrod et al (2001) study looked at operative decompression of the brachial plexus via supraclavicular approach in 170 patients diagnosed with of neurogenic TOS between 1990 and 1999. After an average follow-up of 47 months 65% improved symptoms were reported with 64% of patients claiming satisfaction with the operative outcome while 35% of patients remained on medication and 18% were disabled. Operative decompression was considered beneficial for most patients but it was postulated that socioeconomic status might be related to poor outcome after surgery and psychological factor, education and marital status were found to be associated with self-reported disabilities and, therefore, should be studied prospectively. Landry et al (2001) selected 79 patients with disputed neurogenic TOS between 1990 and 1998 and they reevaluated them at a mean follow-up of 4.2 years after the initial evaluation. Fifteen patients (19%) underwent first rib resection surgery performed by others, whereas 64 (81%) had conservative treatment. The authors did not take part in the decision-making process with reference to the management of the patient’s sample. There was no significant difference between the two groups with most patients able to return to work and demonstrated improvement of symptoms at long-term follow-up. Patients who underwent surgery though missed more work than the conservatively treated patients and first rib resection did not improve functional outcome. Interestingly, Lindgren (1997) examined conservative treatment in 119 patients with symptoms of arm pain and possible TOS after a mean follow-up of 24.6 months. The intervention consisted on restoration of normal function of they cervical and thoracic spine by means of home exercises. At follow up 88% of the patients were satisfied with the outcome of their treatment. Seventy-three percent of the patients returned to work after the therapy although return to work was more often successful if sedentary rather then heavy. It’s very unclear if non-specific neurogenic TOS can be considered a diagnosis and it is fair to dispute its existence since a lot of findings that characterize this pain syndrome cannot be clearly explained on the basis of the current anatomical and pathological knowledge. It is obvious that more studies and research are vital to establish the real cause for this syndrome and the validity of both conservative and surgical treatment, bearing in mind that surgery does not seem to be cost effective and it includes risks that deserve careful consideration. In the meantime a thorough and comprehensive examination is the most recommended approach, in order to facilitate a differential diagnosis at early stages in the best interest of both the patient and the clinician. Atasoy E (1996): Thoracic Outlet Compression Syndrome. Orthopedics Clinics of North America 27: 265-303. Ault J SK (1998): Thoracic Outlet Syndrome. The journal of Manual & Manipulative Therapy 6: 118-129. Axelrod DA PM, Geisser ME, ROth RS, Greenfield LJ, (2001): Outcomes after surgery for thoracic outlet synrome. Journal of Vascular Surgery 33: 1220-1225. Devor M (1991): Neuropathic pain and injured nerve: Peripheral mechanisms. Pain 47: 619-630. Elvey R and O’Sullivan P (2002): “Manual Therapy” A Code of Practice. Draft Document. Perth: 2-18. Elvey RL OSP (2002): “Manual Therapy” A Code of Practice. Draft Document. Perth: 2-18. Franklin GM F-KD, Bradley C, Smith-Weller T, (2000): Outcome of Surgery for thoracic outlet syndrome in Washington state worker’s compensation. Neurology 54: 1252-1257. Gillard J CM, Hachulla E, Remy J, Hurtevent JF, Vinckier L, Thevenon A, Duquesnoy B, (2001): Diagnosing thoracic outlet syndrome:contribution of provocative tests, ultrasonography, electrophysiology and helical computed tomography in 48 patients. Joint Bone Spine 68: October 2001. Kalra A (2002): Thoracic outlet syndrome. eMedicine Journal 3: 14. Kreig L (1993): Thoracic Outlet Syndrome: Pathology and Treatment. The journal of Manual & Manipulative Therapy 1: 52-59. Landry GJ MG, Taylor LM, Edwuards JM, Porter JM, (2001): Long-term functional outcome of neurogenic thoracic outlet syndrome in surgically and conservatively treated patients. Journal of Vascular Surgery 33: 312-319. Le Forestiere N MA, Misonobe T, Leger J-M, Bouche P, (1998): True Neurogenic Thoracic Outlet Syndrome: Electrophysiological Diagnosis In Six Cases. 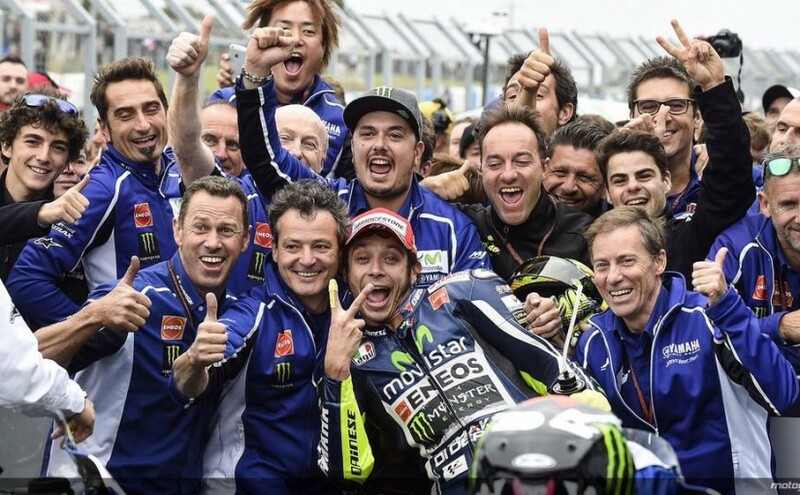 Muscle & Nerve 21: 1129-1134. Magee DJ (1997): Orthopaedic Physical Assessment – Third Edition. Phyladelphia: W.B. Saunders Company. Nichols HM (86): Anatomical structures of the thoracic outlet. Clinical orthopaedic and related research 217: 13-20. Novak CB MS (1996): Thoracic Outlet Syndrome. Orthopedics Clinics of North America 27: 747-762. Oates SD DR (1996): Thoracic Outlet Syndrome. Hand Clinics 12: 705-718. Roos DB (1999): Thoracic Outlet Syndrome Is Underdiagnosed. 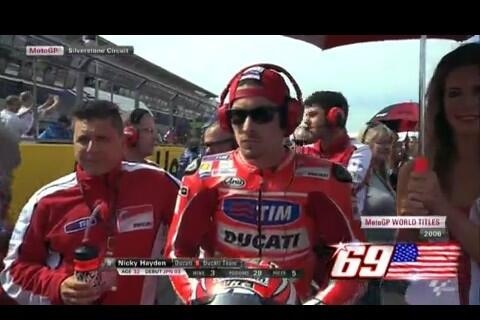 Muscle & Nerve 22: 126-129. Sanders RJ HS (2002): Management of cervical ribs and anomalous first rib causing neurogenic thoracic outlet syndrome. Journal of Vascular Surgery 36: 51-56. Wilbourn ASA J (1999): Thoracic Outlet Syndrome Is Overdiagnosed. Muscle & Nerve 22: 130-136.